How do I access 4Backup? 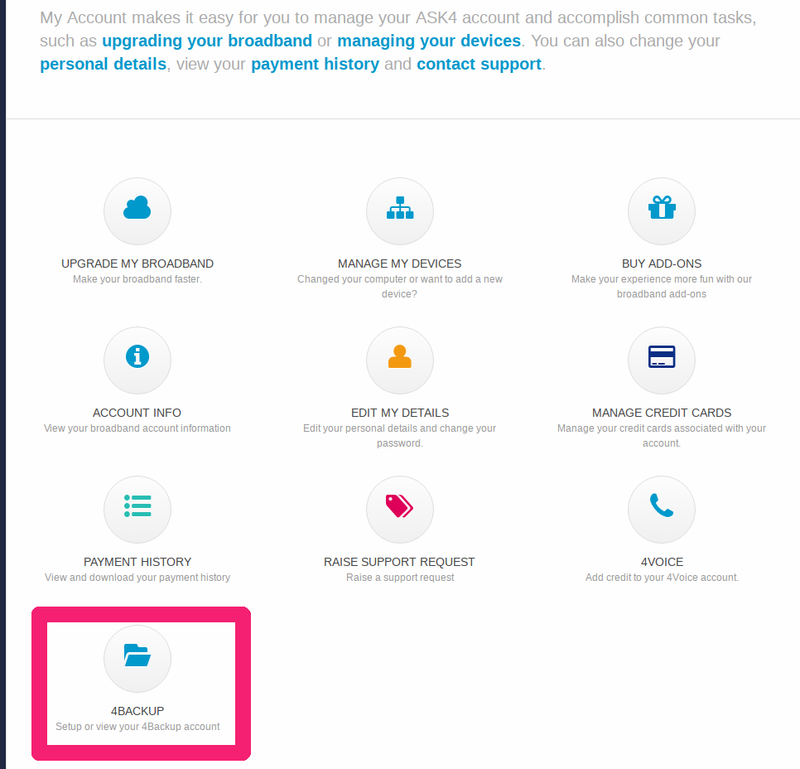 Once you have created an account and purchased the 4Backup addon you need to create a separate 4Backup account through the My Account portal and you can do this by following the steps below. To start with simply head to the 4Backup section either through the home page or the “Jump to section” portion on the left should you be elsewhere at the time. Once there you will be prompted to create an account, this can be any email address and password combination and does not need to match what you have set for your ASK4 account. There is no storage limit. The 4Backup service offers unlimited storage for your backups. How do I access the 4Backup web portal? You can access the web portal by using the following URL livedrive.com/login. Are my 4Backup details the same as my ASK4 account details? Your username and password is whatever you set it to during the registration process and may not your normal ASK4 account. Please note that MyAccount and 4Backup are not linked, so if you have changed your ASK4 password through MyAccount, this will not update 4Backup. If you have forgotten your username you can us on 0114 303 3232 and we’ll be more than happy to give this to you. If you’ve forgotten your password, then you would need to reset this by going here. How secure is the data stored on 4Backup? The data will be stored in multiple locations in custom-built data-centres that use military-grade encryption technology to ensure that your data is safe and secure. In addition, 4Backup supports SSL transfers between your computer and the backup servers, ensuring that data is encrypted whilst being uploaded or downloaded. Is there a limitation of devices that can be used with 4Backup? You can use as many devices as you want. Each device will appear in the Livedrive portal. Which operating systems are supported by 4Backup? Can I access my files on my phone? Yes, there is a Livedrive app available on the App Store, Windows Store and Google Play Store. What happens if I delete a file off my computer, will it still be backed up? The file will also get deleted from 4Backup (Livedrive) and put into the recycle bin for at least 30 days. Please note: 4Backup is not to be used for archiving. You must at all times hold an original copy of the file in the original location on the system it was backed up from. If you delete files from your computer that have been backed up, they will also get removed from the corresponding backup on the servers. What if the originally backed up file has been recently changed on my computer? 4Backup can keep up to 30 different versions of a file. So you can revert to a previous version of the file at any time. How does 4Backup know which files and folders I want to backup? Upon installation of the 4Backup Livedrive software, you will be asked to choose which folders you want to sync for backup. How do I add more folders to the backup scheme? How do I remove files from 4Backup? Click on the Livedrive icon. Navigate to the folder you wish to remove from 4Backup and deselect the folder/file.